Last Friday I was delighted to be invited to go to Lord’s for the annual Middlesex CC Press Day to meet Izzy Westbury, Club Captain, and Beth Morgan, player/coach. I certainly picked a beautiful day to arrive at Lord’s for the very first time, in the sunshine the ground looked very impressive. What I didn’t realise till I arrived was that Friday was the first time, in the Club’s history, that the men’s and women’s press day were held at the same time. Most of the sporting press were there to meet with members of the men’s team, players like Steve Finn, but I was taken across and introduced to Beth and Izzy by the very charming Club Chairman, Ian Lovett. In his introduction to the press, Chief Executive, Vinny Codrington, said that Beth Morgan has been at the Club since she was 13, had amassed 107 England caps in a ten year career during which she had won the ICC 50 over World Cup and World Twenty20 in 2009, the Ashes in 2005, 2008 and 2009 and had recently handed over the reins to Izzy Westbury but was continuing at the Club as player/coach – an amazing cv. Both Beth and Izzy were a pleasure to chat to, and their passion for the sport and enthusiasm is obvious to see. 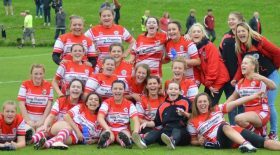 Izzy described Beth as an inspiration not just to her but to all the young players coming through and it’s easy to see why. In turn Beth said how much she was looking forward to working with the talented Izzy. Beth has also worked with the brilliant Chance to Shine project, which encourages youngsters from across the country to play cricket. She also spoke about being lucky enough to play with Charlotte Edwards a quite extraordinary player and leader. And, that’s how it works: players, individuals with a gift for inspiring those around them: Charlotte inspires Beth; Beth inspires Izzy and they both inspire their young team at Middlesex. Two of the Middlesex players were on England duty in Dubai but I was lucky enough to meet four other young players: Catherine Dalton, Naomi Dattani, Anna Nicholls and Ria Raval. All of whom combine either work or college with training and playing cricket, working around mid-week commitments. Its a challenge but there is always the possibility of becoming a professional cricketer now that the ECB have got the ball rolling with 18 professional contracts. The majority of the squad of 15 are under 25 with just the captain (who is 25) and two senior members older, an excellent combination of youth and experience. Many of the girls, including Captain Izzy Westbury, had been playing cricket abroad during the winter months, honing their skills for the season ahead. 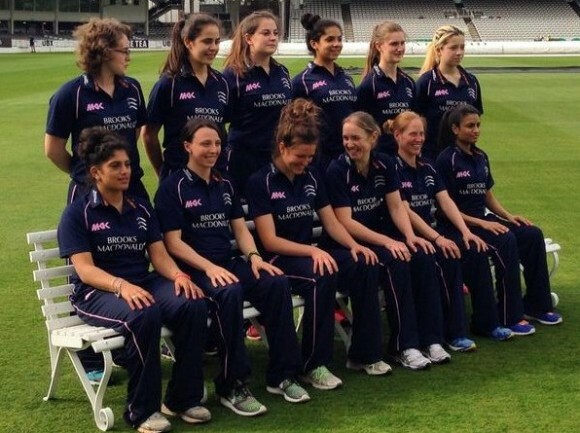 Women’s sport is making strides forward all the time and this year Middlesex Ladies (as they told me excitedly) will play Surrey at the Oval for the first time in the inaugural Pemberton Greenish London Cup T20, on 18th May from 6pm (free entry). One wonders how long before they play on the hallowed turf of Lord’s – I hope I will be there to see them in action.